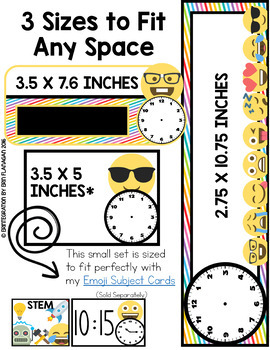 Editable schedule cards with Emojis includes 12 options in 3 sizes! Decide which set works best for you - larger/smaller, with/without clocks, black/white backgrounds, or blackline. Print, laminate and display! All pieces are editable RIGHT in the PDF file. Just click, type your subjects and/or times, print and display! You can also use your own fonts and add more in the included editable PowerPoint files too! ★ EDITABLE Adobe PDF and EDITABLE PowerPoint files to add your own subjects and times. 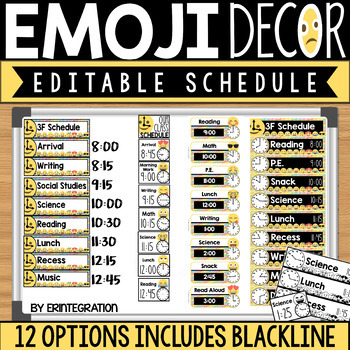 Each editable file has the same 12 options of schedule pieces. ★ 8 versions of the long schedule pieces (approximately 2.75 x 10.75 inches) includes blackline. 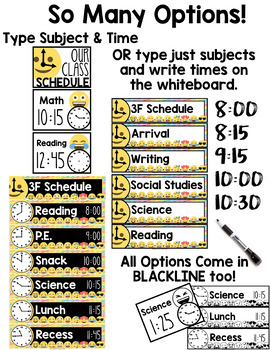 ★ 2 versions of the small schedule pieces (approximately 3.5 x 5 inches) includes blackline. ★ Both the small and medium sets include 24 different Emoji faces! ★ Signs for each set.